The American Gold Eagle is one of the world’s most recognizable gold bullion products. Each coin features iconic American imagery, including Lady Liberty and the bald eagle. 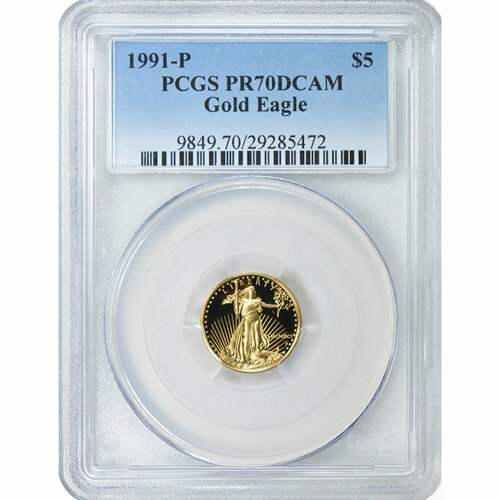 The 1991-P 1/10 oz Gold American Eagle with PR70 grading from the PCGS. The PR70 grade from the PCGS, means that they are considered perfectly struck proof coins with no blemishes. The DCAM (or “Deep Cameo”) designation indicates a coin with a frosted design set against a background field that is deeply mirrored. The “P” mint mark signifies the coins were struck at the Philadelphia Mint. American Gold Eagles are the gold bullion counterpart of the American Silver Eagle. Congress authorized both of these programs in 1985, with the coins first becoming available one year later in 1986. Just like its silver counterpart, the American Gold Eagle is the official gold bullion coin of the United States and, by law, must be struck using only gold that is sourced from within the US. On the coin’s obverse is Augustus Saint-Gaudens’ depiction of Lady Liberty. Featured as a full-length figure, she can be seen walking toward you as you hold the coin. Her extended right arm holds a torch, while her left bears an olive branch. Several engravings are marked here, including “Liberty,” “1991” and 50 stars to represent all of the American states. If you have any questions about our Proof Gold American Eagles, simply call a Silver.com associate at 888-989-7223. You can also contact us online through email or by using our live web chat. Make sure you look over our full offering of Gold American Eagle Coins for other years and certified grades.